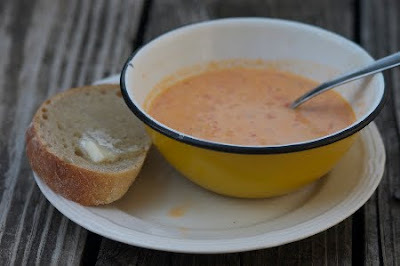 cardigans and kids: tomato soup recipe. pour a couple of tablespoons of olive oil in large pot and heat to medium. Add garlic and chopped vegetables, stirring with a wooden spoon now and again until the veg. are tender (around 10 minutes). Keep partially covered during that 10 minutes. And the broth, tomatoes, red chili pepper flakes, salt and pepper and bring to a boil. After begins to boil, turn back down to medium and cover. Test taste to see if you need for salt, pepper and red chili pepper flakes. After about 10 minutes (or a bit before serving, pour in the cream and chopped basil and stir.) Reheat back to warm. Enjoy with a loaf of fresh or day old bread. I keep the left overs in a mason jar and they last about a week. I am the only one in my home who really enjoys tomato soup. Even with the extra spice, Matheau will eat it with a grilled cheese, but if given the choice, he isn't going to choose tomato soup. I make this entirely and selfishly for myself and enjoy it for lunch when we typically eat left overs, or easy prep lunches so we can get cleaned up and finish up our school day.